Automobile seating upholstery is the most complex part of an automobile interior and one of the most complex forms of all upholstery work. With the many different sewing designs, different materials available and the combinations of and the need to sew the fabric in a way that has very little tolerance to make the "fit", this is where the choice of a good quality auto upholstery shop is so important. Catalina Custom Upholstery is here to provide you with the service and craftsmanship to meet your seating upholstery needs. Below is listed some of the more common seating repair problems / seating upholstery projects that is addressed at Catalina Custom Upholstery. 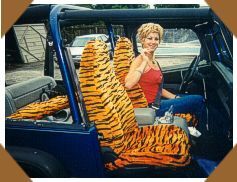 Catalina Custom is also here to provide the complete upholstery of seats in an automobile including repadding, padding repair, padding reinforcement and frame repair if necessary The mechanical parts of a seat e.g. 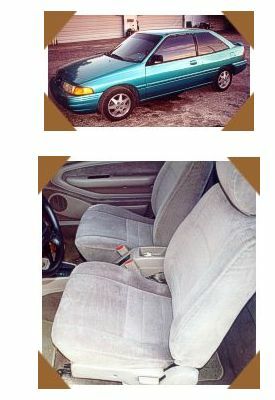 seat tracks, recliner mechanisms, lumbar (whether mechanical or electrical) and other accessories are subject to availability. If an individual has an automobile that is paid off - has kept a good mechanical maintenance program so that the vehicle is mechanically sound - a fresh paint job with new upholstery can give a person an automobile with years of good service. This is also an option for young people getting that first car. Mom and Dad has had a good car for years and now can provide the young one with good dependable transportation to go to school and or work. 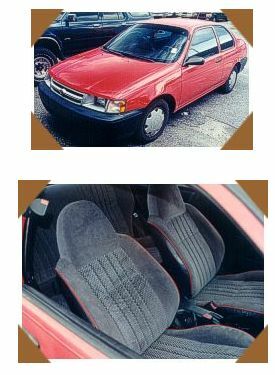 If this a choice for a family car, and the seating upholstery is an area of consideration for renewal, Catalina Custom can provide options that will get the most bang for the buck with good quality materials and working with the consumer with a possible redesign so one can have a brand new refreshing look to enjoy. Catalina Custom can provide you with original cloth, vinyl and leather from the latest of models back to earlier model automobiles. The materials are supplied from a source called "Detroit Originals" and are subject to availablity. The original material samples to match up domestic and some foreign automobile seating fabric is put together in year books called "Original Books" in our industry. This type of repair is very advantageous to individuals that has a lease vehicle with a damaged seat(s) that needs repair when the lease is up to alleviate repair charges. Another option on original automotive upholstery repair is the replacement of leather with vinyl. Leather when not correctly cared for and maintained with leather conditioners and cleaners can turn in appearence. Leather can end up looking overly worn and cracked and or come to have a patina effect - especially on darker colored leather (patina effect is when a luster or shine developes over time with use). When one panel on a seat is replaced with new leather the difference is obvious and to replace the whole seat cover (a cushion or backrest cover) can be expensive. For mid-ranged valued automobiles, a matching vinyl replacement of the leather could be a viable option. 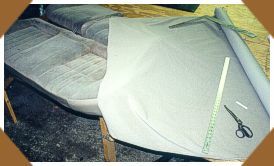 2) Damaged seating panels that need to be replaced with original matching material. A lot of effort has been put forth at Catalina Custom over the years in continually fine tuning the abilities to produce and provide quality products in seating upholstery with craftsmanship, material / product research and working with the customer. Catalina Custom can provide seating upholstery that can be shown with pride with a feeling of money wisely spent. Visit the Showroom Gallery to view many examples of before and after seating upholstery done by Catalina Custom Upholstery. Further inquiries please contact us. Common seating repair is an area that Catalina Custom has helped many, many people over the years. Common seating repair is repairs that may need just a seam taken up or added to repair a tear or burn hole. A non-original panel replacement with other panels added for color balance is another option. Each repair job is unique and Catalina Custom is here to provide you with the easest, most economical was possible to repair the seat. Another area of seating upholstery that Catalina Custom can be of service is the unique seating situation that will meet your needs and or desires. While it is impossible to list all the different variables that might be presented, some examples of the different desires accomplished and problems addressed that has been presented to Catalina Custom over the years can be viewed by clicking here.